A frozen tongue on a metal post, a children’s toy that might put your eye out, and a leg lamp glowing in the living room window. Those familiar movie images come from a popular holiday film that was shot over 30 years ago in Cleveland. A cottage industry has developed that celebrates the city’s connection to A Christmas Story. Cleveland Play House artistic director Laura Kepley says a stage version of A Christmas Story is a gift that keeps on giving. Kepley says it also offers an alternative to shows like The Nutcracker or A Christmas Carol. The film’s other iconic prop is a tawdry leg lamp that arrives at the house one day in a mysterious big wooden box. As the movie’s popularity grew over the years, San Diego businessman Brian Jones and his family started making and selling leg lamps. Then one day, he saw a notice that the house where the movie was filmed was on the market. He took out six credit cards to pay for a full renovation of the deteriorating structure. It opened as a tourist attraction in 2006. Jones says the first holiday season, there were four-hour waits to get into the tiny, mustard-yellow house on Rowley Avenue. Attractions include a visit to Ralphie’s bedroom, the cabinet beneath the kitchen sink where his brother hid and, of course, a leg lamp in the window. Though the biggest crowds come during December, the Christmas Story House is open year round. There’s also A Christmas Story gift shop, featuring everything from plates and cookie cutters to leg lamps. A Medina candy company manufactures a product called “OHH…FFFFUDGE.” Great Lakes Brewery bottles “Tripel Dog Dare” (an insider beer joke: “Tripel” is the name of a strong German pale ale). Earlier this month, there even was A Christmas Story Run from the house to Public Square downtown. Other ties can be seen all over Northeast Ohio. 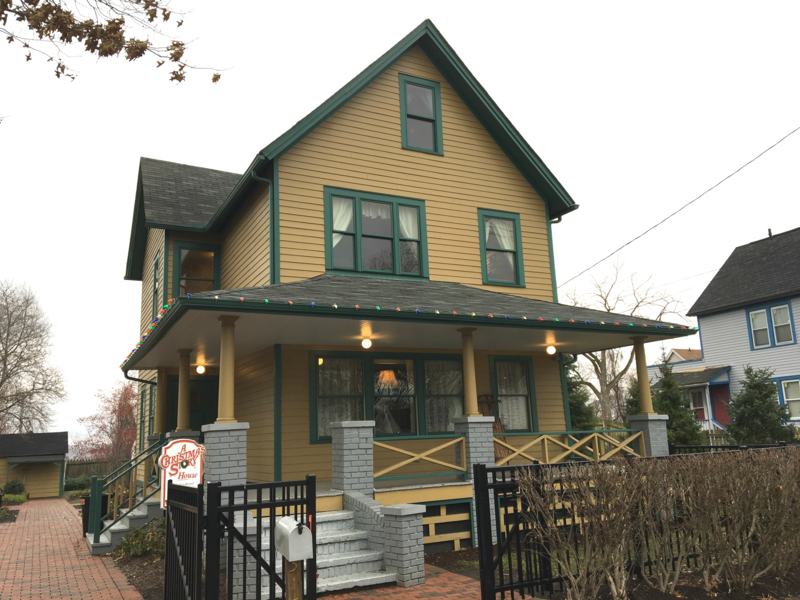 A Cleveland donut shop sells a line of A Christmas Story pastries, and a Christmas museum in Medina even claims to have the original department store slide that Santa kicked Ralphie down in the movie. Across the street from the A Christmas Story house, a leg lamp also glows in the window of the 111-year-old Rowley Inn. Ted Polanski owned the bar for 37 years before selling it in 2014. He still comes in three days a week to work the early morning shift. Polanski grew-up here on the South Side and his wife and kid had bit parts in the movie. At 76 years, Ted Polanski’s seen a lot of changes in his city and his neighborhood. If you stop by sometime, maybe he’ll pour you a Red Ryder cocktail and tell you some stories.